Barrel: 4150V chrome moly steel. 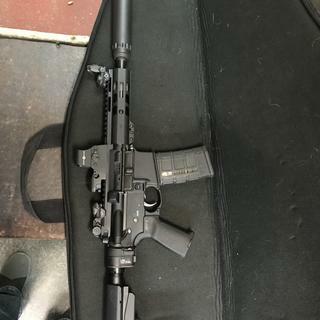 Chambered in 300AA Blackout, with a 1:8 twist rate, M4 barrel extension, pistol-length gas system, and nitride treated for accuracy and durability. This heavy profile barrel is finished off with a PSA 7" Lightweight M-Lok free-float rail, .750" low-profile gas block, and an A2 flash style flash hider. Upper: Forged 7075-T6 A3 AR upper is hard coat anodized. These uppers are made for us right here in the USA! Bolt: Full-auto profile bolt carrier group. Shot-peened, mil-spec Carpenter No. 158® steel bolt. Gas Key Hardened to USGI Specifications, Fastened with Grade 8 screws, and Staked Per Mil-Spec. Lower: These forged lowers are quality made using 7075-T6 aluminum and are marked "MULTI" for caliber. Finish is hardcoat anodized. 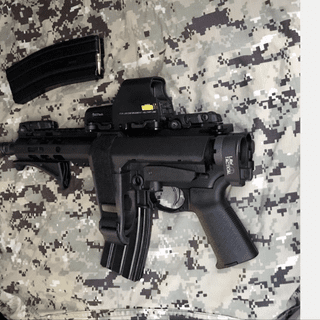 Pistol 7075-T6 buffer tube is hardcoat anodized and is fitted with an SB Tactical SBA3 Adjustable Pistol Brace, Magpul Grip, and Enhanced Polished Trigger (EPT). Twist Rate: 1 in 8"
What is the total length of this weapon? BEST ANSWER: It's about 23.3 inches with the brace collapsed, and 25.8 with it fully extended. With the LAW folding stock adapter folded what is the overall length? that is a sweet setup Mr. Clay D! BEST ANSWER: IF ANYONE FIND OUT I WLL LOVE TO KNOW I HAVE THE SAME QUESTION THANKS IN ADVANCE. Will the action cycle if used with a suppressor and sub-sonic ammo? BEST ANSWER: Yes, thanks to the pistol length gas tube. CAN SOMEONE TELL ME THE TOTAL LENGTH? 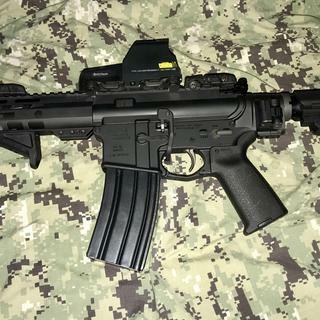 How does this AR compare to the name brand budget ars? With the short barrel, can I only use sub sonic ammo? BEST ANSWER: You can use both sub and supersonic ammo with the 7.5" barrel. Does the bolt lock back on empty? Will this allow you to swap out the current trigger for Franklin binary trigger? BEST ANSWER: It should be able to. 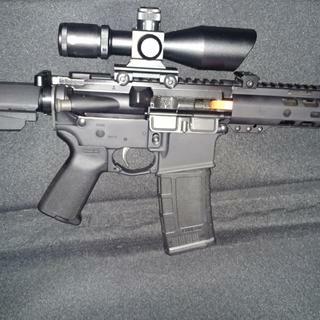 Its basically an AR15 platform with a different barrel for the 300AAC cartridge. If it fits in the AR platform, it fits. Does this also fire .223? BEST ANSWER: All you would have to do is get a 223 or 556 barrel assembly, pop two pins, remove the 300 AAC barrel assembly and drop on the 223 (or preferably 556) and your good to go. The same magazines will work, but make sure you don't run 300 AAC in your 223/556 barrel or vice versa. No. ..300 Bkackout only, although you can swap uppers. Can you take off the muzzle brake and install Sandman L Suppressor and their muzzle brake? if so what is the thread size? BEST ANSWER: The muzzle thread pattern is 5/8-24. Yes, the standard flash hider is removable and there should be sufficient clearance to install whatever muzzle device/suppressor you like. 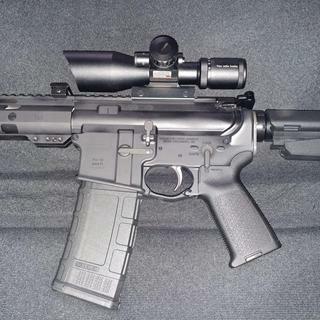 Do you need a nfa stamp for this? 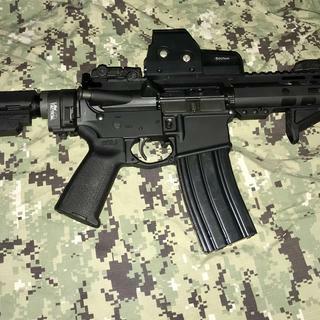 Can I put a 7” m lok hand guard on this instead of what it comes with? Are they all interchangeable? 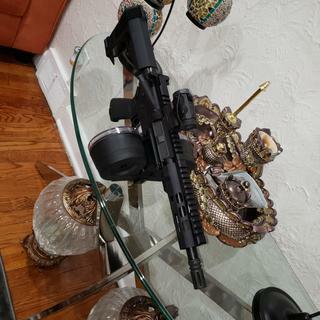 THERES ANY ONE KNOWS IF THIS WILL FIT A 1913 FOLDABLE GRIP ON THIS PICATINNY RAIL .? what is the velocity difference between a 9 inch barrel and 7.5 inch barrel? What is the weight of the pistol? What is the weight for the buffer spring? 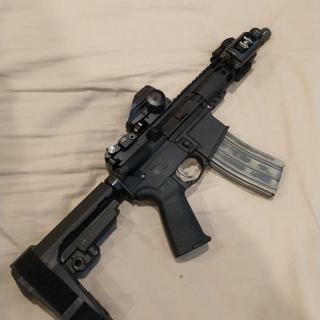 Had this gun for a few months now and love it. One word of caution is you may have trouble finding mags that feed well. I have not had good luck with Pmags and other plastic . So far the best have been surplus metal magazines, with those I have had zero failures. Just have to order two! I purchased this as a gift for my wife. 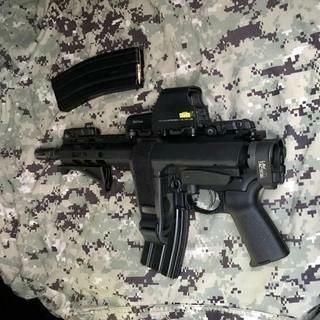 This pistol is so much fun to shoot I need to order a second one! Shipped very quickly. Looks great, shoots great. Trigger is a bit stiff. Will probably replace it. Already added a Law Tactical folding stock and Yankee Hill Resonator suppressor. I LOVE THIS LITTLE GUN!!!! This is a fantastic weapon at an even better price! It’s fun, accurate, and ,with the installation of my Law Tactical Folding Stock Adapter, it’s very concealable. It fits perfectly in a medium sized backpack. I’ve installed a holographic sight and MBUS. I can cut a ragged hole at 50 yards and keep all my shots with 5” at 100 yards. I’ve run several types of ammo through it, sub-sonic and supersonic, factory loads and reloads. Never had a fail to feed or fail to fire. Shouldering the arm brace is (almost) comfortable. In all, this is a very well-built, reliable, and great looking weapon. It’s very versatile and doesn’t drain the wallet. Good unit for the price, solid.